Do you want to find out what makes Barcelona the most popular destination in Spain? Do you want to experience 2,000 years of history? Our Old Town tour through Barri Gotic & El Born brings you to the heart and soul of Barcelona. You weave through a maze of streets and uncover Barcelona’s gems. The free walking tour of Barcelona’s Old Town is operated by Barcelona’s Donkey Tours. We love their tours and their guides. Guests we have sent there have given Donkey Tours 5-star reviews. For this tour, advanced booking is mandatory. The Old Town Barri Gotic & El Born free tour runs every day at 11am rain or shine. It is closed only on Dec. 24, Dec. 25, Dec. 31 and Jan. 1. In English, 2.5 to 3 hours. 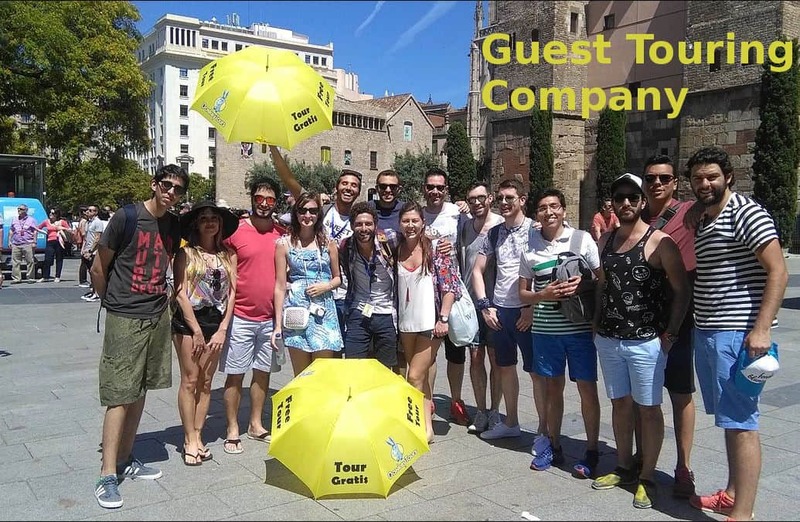 The tour meets outside Se, Barcelona’s Cathedral, situated on plaza nova, at the end of carrer dels arcs street. The closest Metro Station is: Urquinaona (line 1 and 4). Meet Donkey Tours at their oversize yellow umbrella. Booking is mandatory for this tour. Only a local guide can walk you through the Old Town’s maze. Get all the points of interest – and the stories to boot. This is a free walking tour of Barcelona’s Old Town – Barri Gotic & El Born. You pay the guide what you want after the tour. Advanced reservation is required for this tour. Please join the meeting point 5 minutes early, and look for Donkey Tours’ yellow umbrella.la. It makes sense to hire a private guide if you travel as a group of friends or as a school. A private tour costs €125 and up, depending on group size and tour duration. The tour is capped at 25 guests per guide. If the group is larger, it gets split across several guides. On hot days, we walk mostly in the shade, and we include water fountains in the itinerary. Average duration: 2.5 to 3 hours. The tour ends near Plaza Reial, closest metro station is: Liceu (Line 3). Travelers in wheelchairs can take part in this tour. To join, look for Donkey Tours’ distinct yellow umbrella in front of the Se Cathedral. The tour starts outside Se, Barcelona's Cathedral, situated on plaza nova, at the end of carrer dels arcs street. The closest Metro Station is: Urquinaona (line 1 and 4). This tour is operated by Donkey Tours. Duration: 2.5 to 3 hours. Tour ends near plaza reial, near metro station Liceu (line 3). Meet the guide under the oversized yellow umbrella.